When Germany lifted the 2017 FIFA Confederations Cup on Sunday, it was the latest trophy in an already rich stream of international footballing success built on infrastructure, education and investment. With a 1-0 victory over Chile at St. Petersburg Stadium, Germany won their second title in the space of 48 hours, with their U21 delegation having won the European Championships against a strong Spanish side in Poland the day before, also by a 1-0 scoreline. Germany hold those two titles as well as being current world champions, and will aim to defend the World Cup they won in Rio in 2014 at the 2018 tournament in Russia next year. When the official FIFA world rankings were published on Thursday, Germany were number 1, climbing from third to dethroned Brazil at the summit to be named the best team in the world. In Sunday’s final, a Lars Stindl goal was enough to beat the Chileans. It was the striker’s third goal of the Confed Cup, which saw him join teammates Timo Werner and Leon Goretzka as joint leading scorers at the tournament. That stat was one of many records Germany held at the Tournament of Champions, with ‘Die Mannschaft’ also topping the stat charts for most goals scored, youngest goalscorer, fastest goal and most tournament wins. On top of that their captain, Julian Draxler, scooped the ‘Golden Ball’ award given to the best player of the tournament. 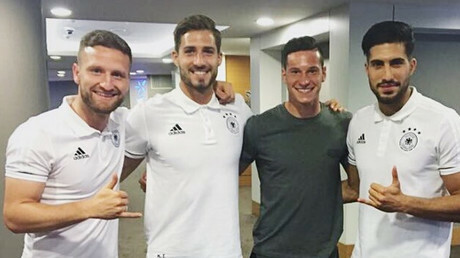 At 23 years old, Draxler is usually considered one of the less experienced members of the German senior side, behind world stars such as Manuel Neuer, Toni Kroos and Mesut Ozil – none of whom traveled to Russia. However, despite the inexperience of the Confed Cup side, Draxler led his country to victory against much stronger and more experienced opposition. But Germany’s strength in depth and sustained success is no turn of fortune. Speaking to RT Sport after Germany had cruised through to the Confederations Cup final by beating Mexico 4-1 in Sochi, former national team striker Oliver Bierhoff, now ‘Die Mannschaft’ general manager, said that Germany are now enjoying the fruits of successful long-term planning. “Well, it’s a long story. We started in 2000 with the great infrastructure, we are well organized in Germany, you know that,” Bierhoff began, without a hint of facetiousness. “We have a lot of investment in our professional clubs. In the youth area we invested a lot, the federation, in the education of coaches and I think also the co-working amongst the confederations and the professional clubs is very good. “Our players also have the possibility to get places in the Bundesliga, this way perhaps it’s a little bit easier than in the (English) Premier League. “I think it all comes together and you see all these players have a good education, technically-wise very educated, and they also know how to play in different systems,” he added. Bierhoff knows what it takes to cut it at major international tournaments: he won the UEFA European Championship in 1996, scoring both goals in the final against Czechoslovakia, during a career in which he made 70 appearances for Germany. The roots of the current success can be traced back to 2000, when Germany won the right to host the 2006 World Cup. A wealth of stadiums meeting FIFA’s minimum 40,000-capacity requirement, including several with 5-star UEFA ratings, meant the 69,000-seater Olympiastadion in Munich was overlooked for the finals. Russia won its World Cup bid in 2010, and six new stadiums in the cities of Rostov-on-Don, Saransk, Samara, Volgograd, Nizhny Novgorod and Kaliningrad are currently being built especially to host matches at the tournament. 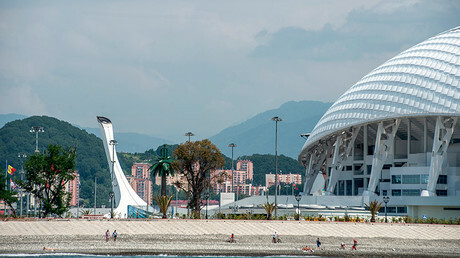 Moscow, St. Petersburg, Sochi and Kazan were host cities for the Confederations Cup, and will repeat that honor at the World Cup next year, with Ekaterinburg completing the list. Bierhoff believes Germany’s success in planning cannot be emulated overnight and that if the Russian team are to reach such levels, especially in time for the FIFA World Cup next summer, paying attention to detail in the final stages of preparation is key. “I don’t know the infrastructure of Russia but what worked for us was a 10-year plan. You can’t change it in one or two years because now you have to play with the players you have. But it’s good to have a long-term investment and every country wants to improve the players,” Bierhoff said. Russia’s infrastructure impressed international visitors to the Confederations Cup, proving it could accommodate the large number of football fans from the eight participating nations with a view to next year’s World Cup. The FIFA World Cup will, however, be a much bigger test of Russia’s planning, infrastructure and investment into the tournament, and will also provide the stage for Germany’s defense of their title. If winning the right to host the 2018 World Cup does as much good as it did for Germany, Russia can count on a bright future for the country's footballing landscape.